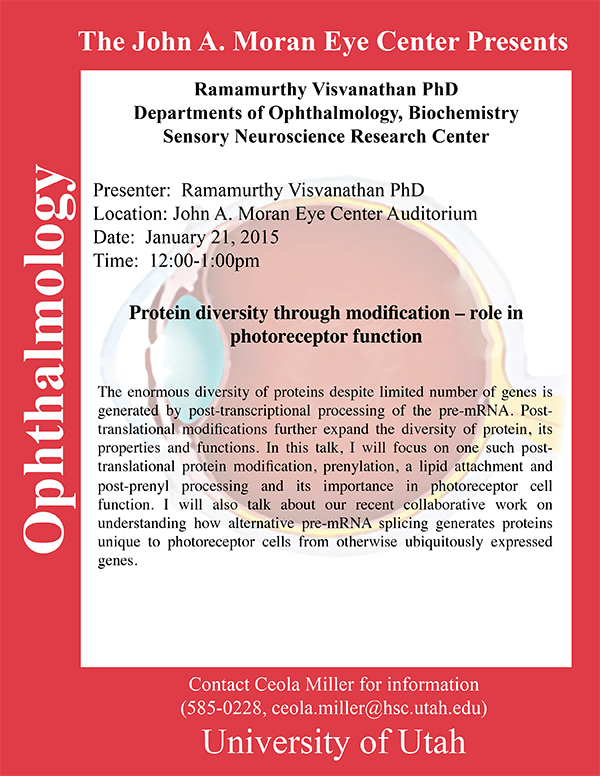 Ramamurthy Visvanathan from West Virginia University will be delivering a seminar on Protein diversity through modification and its role in photoreceptor function on January 21st, 2015 in the Moran Eye Center auditorium. Abstract: The enormous diversity of proteins despite limited number of genes is generated by post-transcriptional processing of the pre-mRNA. Post- translational modifications further expand the diversity of protein, its properties and functions. In this talk, I will focus on one such post- translational protein modification, prenylation, a lipid attachment and post-prenyl processing and its importance in photoreceptor cell function. I will also talk about our recent collaborative work on understanding how alternative pre-mRNA splicing generates proteins unique to photoreceptor cells from otherwise ubiquitously expressed genes.